Many kinds of souvenirs are sold in stores close to Kuta Beach, Bali. Not only clothes, painting, or sculpture, which is often found around attractions throughout Bali. There are also home accessories made of pieces of glass. 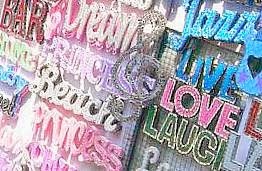 Accessories in the form of letters, numbers, words, or symbols, or combinations that make up words as you wish. Trinkets uniquely shaped glass of various colors, with interesting and amusing shapes. These Trinkets can be found in the Si Doi Corner, at the junction at Jalan Legian and Jalan Patih Jelantik. Precisely in the front hallway Jelantik Road. Trinkets are very cute and lovely, the time of day if exposed to sunlight, then these trinkets will reflect light, so it looks very nice, trinkets such as burning and shining. If the evening when exposed to light from the lamp, these piercings look very beautiful. Colorful lights will make this ornament lit colorful. When shaken it will look like a disco light. Ablaze with color. These Trinkets are sold for souvenirs, or as a memento after visiting Bali. The price depends on size and shape, and relatively cheap, according to the results and uniqueness. The price starts from Rp. 100.000 The more complex and large in size, the more expensive price. These Trinkets is quite popular, and many bought by foreign tourists. Unique shape, different from the general souvenirs on sale in Bali. Perhaps only in stores that are selling it. Or maybe there is another store. Because I have not found other than on the koto. We can order these trinkets liking. So the size of the shapes and patterns can be determined according to their own tastes. Of course, with different prices, according to the complexity and amount of material used.